The Harriet Jacobs Project at Yale University includes writings by and about Jacobs and a resource guide. 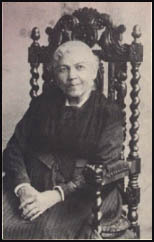 Harriet Jacobs. This site by Trudy Mercer includes a picture, a chronology, bibiographies, an essay, and three letters between Harriet Ann Jacobs and Lydia Maria Child. The Harriet Jacobs page at the Africans in America site includes pictures, letters, and the full text of the handbill offering a reward for her capture. Review of Jean Fagan Yellin's new biography of Jacobs from the New York Times (free registration required). From the review: " Yellin also sheds fresh light on Jacobs's love affair with Sawyer. Flattered by his kindly attention and hoping that he would buy her from Norcom, the 15-year-old Jacobs became his mistress. She entered the relationship with a mixture of emotions -- shame, hope and guilty attraction -- that she subtly describes in her autobiography. Sawyer, as Yellin writes, was a personable bachelor with political aspirations (he was a descendant of a colonial governor of North Carolina and was related to the state's current governor) and later served as a congressman. Jacobs was perhaps justified, then, in believing that he had enough clout to shield her from her oppressive master. Tragically, she was wrong. The inexorable harshness of her master drove her to seek refuge in her grandmother's attic, where she lived alone for years in gloomy isolation. About 9 feet long, 7 feet wide and 3 feet high, the attic admitted no light until Jacobs drilled a tiny hole. It was stifling in the summer and frigid in winter, home to rodents and stinging insects. Jacobs could not stand up, and when she rolled over she bumped her head on the roof. Despite the discomfort and the isolation, Jacobs preferred staying there to living as Norcom's slave. Yellin reports that Jacobs sometimes experienced hallucinations brought on by sensory deprivation."